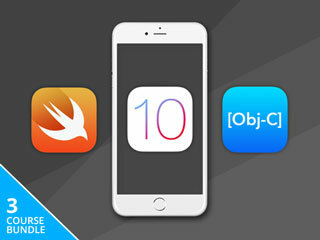 Launch your career as an iOS programmer for just $44 - the Swift 3 Master Coder Bundle is 92% off at Escapist Deals. Create a portfolio of apps as you learn your way around Swift 3. This 19-hour course takes you through every step of the process, including adding audio and animations to your apps. Increase your chances of having your app accepting by the app store with this 5-hour course. You'll start by building small apps, mastering skills that'll come in handy when you're creating to make more complex apps. Create over 20 real iOS 10 applications in Swift 3 & Objective-C, explore storyboard and nib files, and learn social integration with Facebook, Twitter, SMS, email, and more with this 45-hour course. Demos and challenges take you through every step of the app-building process. Learn how to embed web content in your app, show your user's location and address on a map with MapKitView & geolocation, and more. Get the Swift 3 Master Coder Bundle for 92% off at Escapist Deals.